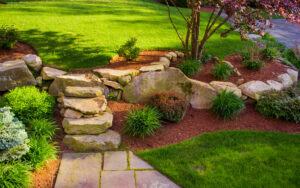 It’s never too early to start thinking of a new backyard landscape once the weather becomes warmer! While it is still definitely winter, and we are in the middle of some freezing cold temperatures, it’s never too early to start thinking of a new backyard landscape once the weather becomes warmer. Here are some ideas for your new back yard landscape. If you want a private space where you can clear your mind right in your own backyard, consider adding a meditation garden. Choose plants and flowers that will help you relax. Pleasant smells, light colors, and other plant life that will promote feelings of relaxation right there at home. You can use water features to create a wide variety of sounds and visual effects in your backyard. Depending on materials, placement, and water flow, the soothing sounds of water features can change to suit whatever you’re trying to do with your backyard design. Gaining privacy in your backyard doesn’t have to mean putting up a large fence. You can easily use hedges, bamboo plants, or evergreen shrubs to give you plenty of privacy all year-round. Adding a border of plants can also help your backyard feel more exotic. Whether you intend to fill your backyard with colorful flower gardens or lots of green grass, you can use pavers to create paths through it. You can all sorts of decorative designs with the pavers, and they come in many shapes and sizes so that you create whatever design will suit your home best. When designing your backyard landscape, you also need to think of your pets. Take care not to plant anything that will be toxic to your pets if they eat them. Putting fences around the plants will help keep both the plants and the pets safe from each other. This entry was posted on Friday, January 5th, 2018	at 11:39 pm	and is filed under Landscaping Design	. You can follow any responses to this entry through the RSS 2.0	feed. Both comments and pings are currently closed.